that are safe. Tsebo’s cleaning professionals are called upon to perform their duties under many different circumstances and the Tsebo Solutions Group ensures that in every instance we adhere to safe practices. 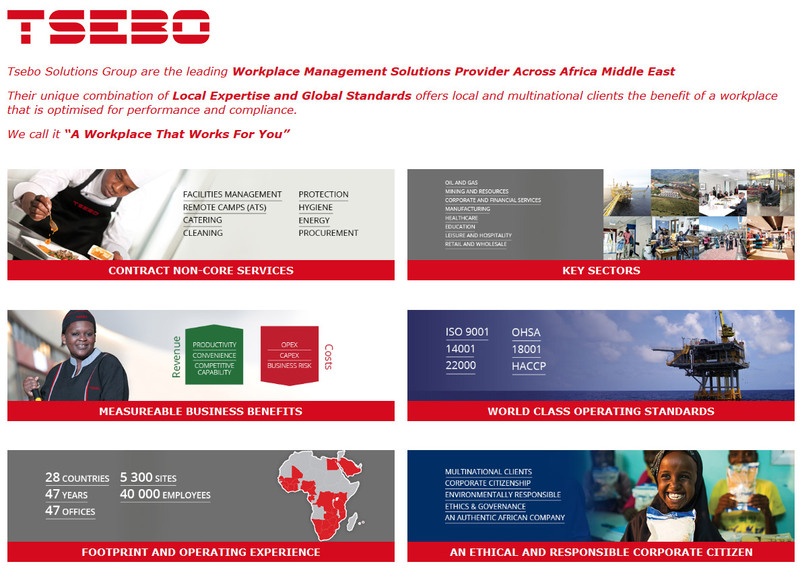 The Tsebo Solutions Group supports the Occupational Health and Safety Act, 85 of 1993. To ensure compliance in our business with this legislation, we engage in continuous training on accident prevention and constantly update our GMPs in accordance with the latest practices in this field. Over and above all this, we have an internal team that audits operational practices on Occupational Health and Safety in order to drive continuous improvement.